To photocopy or not to photocopy? I’m a big believer in hard copy. In most organizations, no matter how much you push computer filing protocols, people’s computer files will be stored idiosyncratically if not completely arbitrarily. But somehow, people behave themselves with hard files. So I always copy my proposals. Right about here the recycling police are going nuts. All that paper! Killing trees! So much space. And yes, they’re right. In the new reality, we really need to be sensitive to this sort of thing. First of all, always make your file copies 2-sided. Don’t use scrap paper; this is too confusing. Just duplex all your file copies. You also don’t need to copy everything. 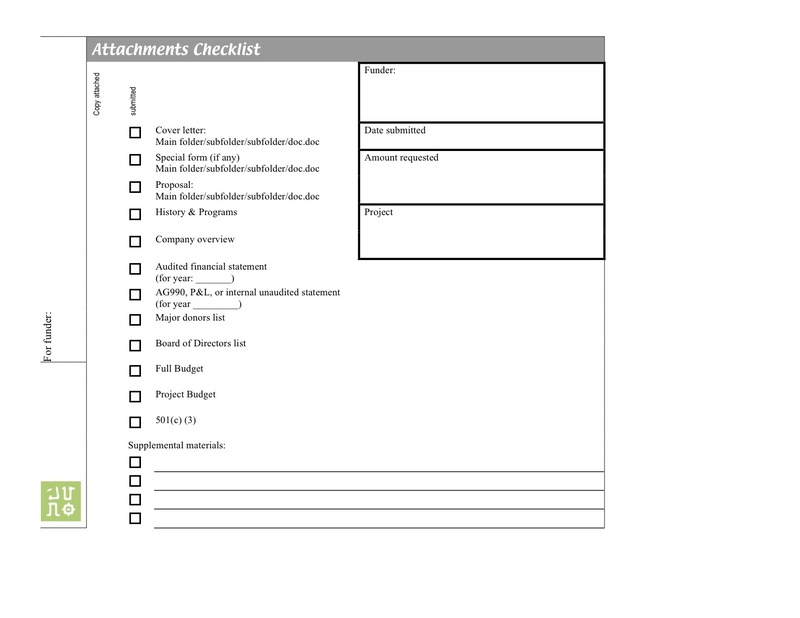 Standard attachments like the board list, current funder, annual budgets, et cetera can be noted on a simple cover sheet. I created a simple form that shows what pieces are attached, and what are standard, as well as giving the computer location of the main proposal. This form can be printed out blank and filled in by hand, or you can make it a merge file and link it to your spreadsheet or donor database. I’ve gone back into organizations that I used to work for, years later, and found these forms still in use. Very gratifying.